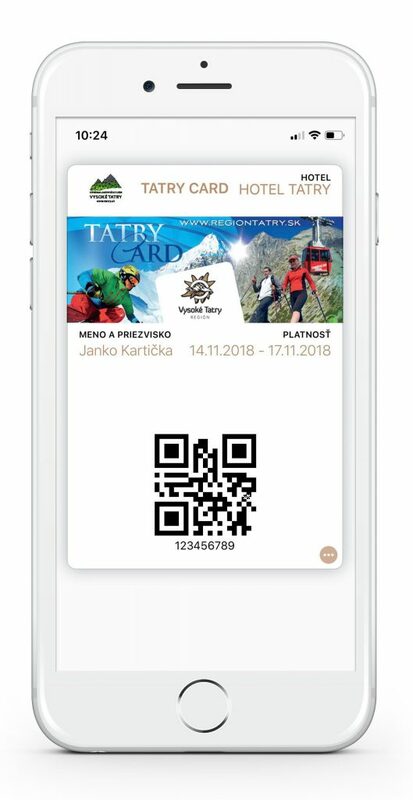 Región Vysoké TatryAccommodationWhat is the Tatry Card? The regional TATRY Card is the key to unforgettable moments and activities that the High Tatras Region offers. Use great ski school offers and rent equipment at reduced prices. Enjoy snow adventures with snow tubing and discover winter beauties in the Tatras in snowshoes with a guide. Visit museums, try a golf simulator and choose from various interesting outdoor and indoor activities. Recharge your batteries in modern wellness centres and taste delicious culinary art in restaurants. 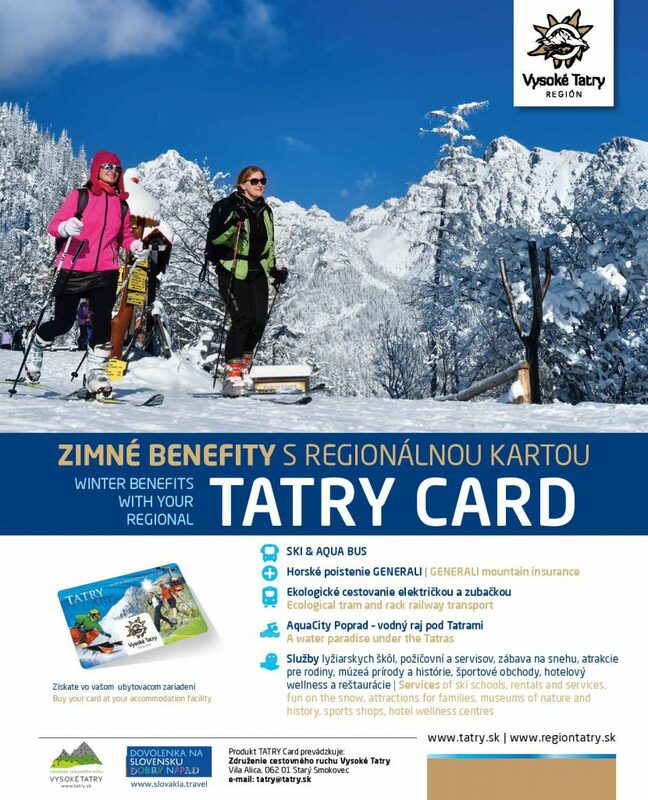 The TATRY Card includes GENERALI insurance for the mountains as well as unlimited ecological transport in the High Tatras with trains of the ZSSK company (Slovak Railways) on the routes of the Tatra Electric Railway, Rack Railway and the route Poprad-Tatry – Studený Potok –Tatranská Lomnica, where the TATRY Card can be used as a travel ticket. Buy your personal regional card at your accommodation provider. It costs 4 € in facilities located in the High Tatras Region (town of Vysoké Tatry, town of Poprad and settlement of Štrba) and 5 € in the foothills. The TATRY Card is valid during the whole stay of yours. The maximum period of validity of 1 activated card is 3 nights (4 days). 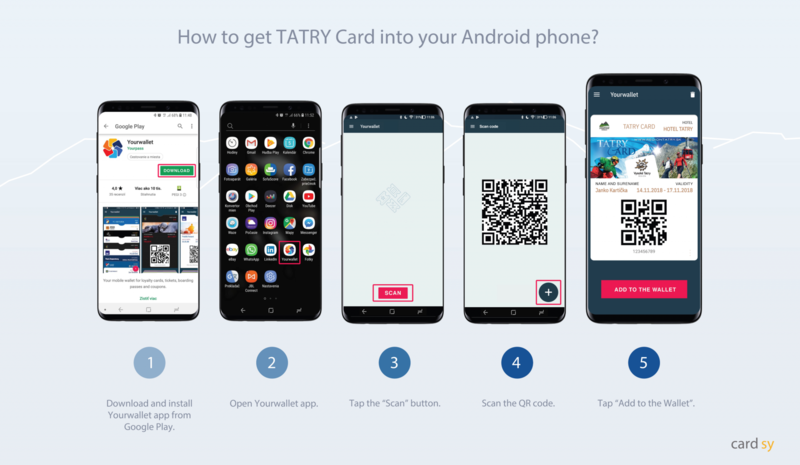 If you stay longer than for 3 nights (4 days) or you already have a TATRY Card, you will get another stay activated on your card by your accommodation facility at the same surcharge of 4 € / 5 €. At the reception of your hotel you will receive a registration form, where you will find the bottom part, which contains two unique QR codes. One of these is for downloading a digital /virtual card into your mobile phone, and the other with the name and date of validity is for those who prefer the paper version or those who do not have a smartphone. The paper version is only for transport and insurance. To get discounts you must have a digital card downloaded in your mobile phone. Not applicable for transport and insurance. 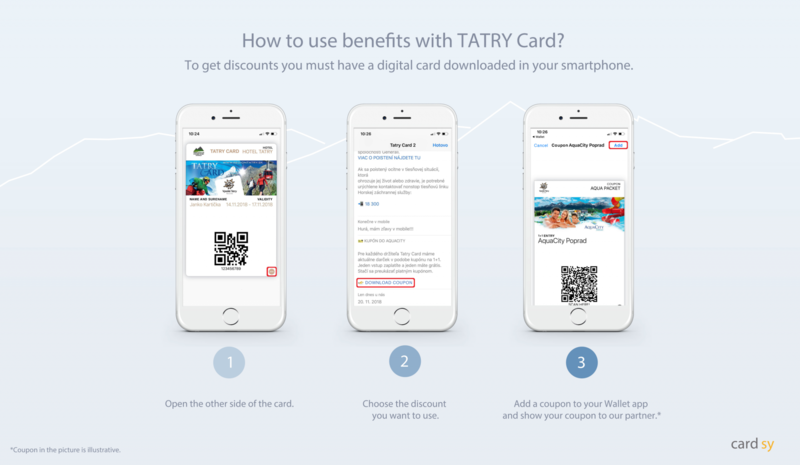 How to download a discount coupon into your mobile phone. 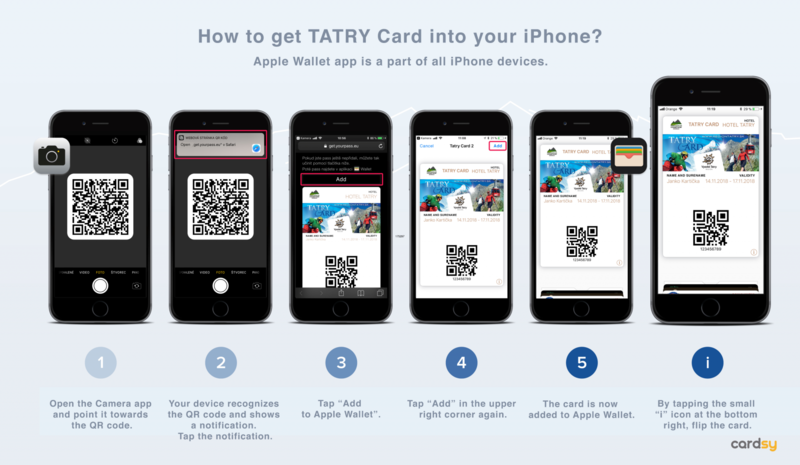 Don´t forget to inform the staff in advance and tell them you are a TATRY Cardholder. Discount rates, price reductions, benefits and free services included in the card are specified in the description of each product or service and they are fixed during the whole season. Prices determined by individual service providers are subject to change. Unless specified otherwise, the discounts are available during the whole winter season from 20/12/2018 to 30/04/2019.